In this month’s blog article, Secondwind Commercial and Public Water Systems Manager Steve Guercia likens the successful treatment of a commercial drinking water problem to playing a strategic game of chess. Do all commercial water treatment companies know how to treat water? Seems like a stupid question, doesn’t it? But hear me out. Knowing how all the chess pieces move and mastering how to play a thoughtful game of chess are two entirely different things. Likewise, knowing what a water softener does isn’t the same as knowing how to solve and treat a complex water quality problem. A successful water treatment company—like an accomplished chess player—knows, among other things, how to problem solve, and think creatively and strategically. 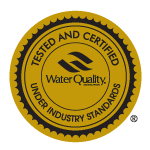 The Seconwind team has been treating commercial and residential water quality issues for 30 years. During that time, our team has learned the importance of creative thinking and strategic decision making, and we bring these skills to every job site. The value of our experience and skills is best illustrated by looking at one of our a real-life commercial water treatment customers. 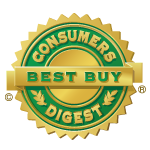 This customer highlight shows how we tackled the problem of gasoline-contaminated water. We aren’t including the company’s name because even though their water is treated and safe, public perception doesn’t always line up with that. Over 15 years ago, we helped the owner of a New Hampshire apartment complex treat a gasoline contamination problem in their well. We stepped in after their current water treatment company failed to address the issue. In addition to successfully removing the gasoline, we removed high levels of iron and manganese. To this day, the owner of the building raves about our success in maintaining the quality and safety of his water. This year, we were presented with a new problem. The apartment complex is next to a river that flows into a municipal reservoir. There was a growing concern that some of the gasoline in the backwash water might find its way into the river. We needed something to do with the backwash water as soon as possible. Because sending backwash water into the ground or sewer wasn’t an option in this case, we needed to come up with a creative solution. We decided that the best solution would be to install tanks that could be pumped out weekly. 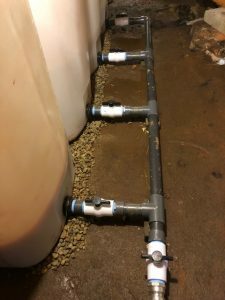 There were two problems with this idea: 1) To pump out on a weekly basis, we’d need about 1,200 gallons of storage; and 2) Installing these tanks outside would subject the backwash water to freezing. After some thinking and strategizing, we came up with a plan: installing four-400 gallon plastic tanks in the basement. The tanks didn’t fit through the basement entrance, so we hired a contractor to dig up the bulkhead. We installed the tanks and tied them together so they could be pumped out as one tank. Afterward, we put the bulkhead back together, leaving their property undisturbed. 1. We installed a high water float that closes a valve on the backwash line so the tanks wouldn’t overflow. 2. In the event this happens, the treatment will fail since it can’t backwash. 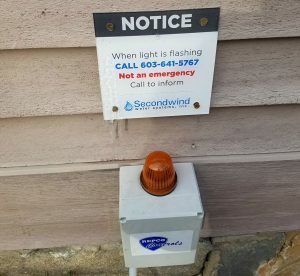 We installed an outside strobe light to alert the apartment complex owner, manager, and tenants when the high water valve closes. We also installed a sign next to the strobe light that tells people how to contact Secondwind. 3. To prevent any gasoline fumes or odors from filling the basement everytime the tanks were backwashed, we connected a vent line from the tanks to the the outdoors. This job clearly required a lot more than simply installing a system, or knowing how to move a few “game pieces” around. It required creative thinking and strategic decision making to solve rather complex water quality and safety problems—much like the skills needed to win a game of chess. For 30 years, Secondwind Water Systems has installed, repaired, and serviced home and commercial water treatment systems throughout New Hampshire. If you have any concerns about how your water affects your business, give us a call at (800) 287-5767. We’re happy to come out and provide a free site analysis.